Regular MML readers know that we’re closely following the debates over re-zoning in Cloverdale Five Points (the part of town with Sinclair’s and The Capri). For those not as geeked out about zoning as we are, the story so far is basically that the City wants to switch over to SmartCode in this part of town (We have collected drawings and documents here for your reference). That push is still going forward, but in the short term, the City is asking for a rezoning of the Lowder property at the corner of Boultier and Fairview. That’s the western part of the building that used to be a school. For those not totally conversant with the area, it’s near Huntingdon College (once an owner of this parcel), across the street from Sinclair’s and also from the 1048 nightclub. As it stands, this property is zoned B-1-a. The City is hoping it can be zoned B-1-a-q. Your eyes glazing over yet? It seems the “q” stands for “qualifications.” According to City Planner Tyler Caldwell, “The addition of the q denotes qualifications that restrict potential developments on this property to conform to the standards laid out in the T4-O SmartCode Transect. The only additional qualification is the permission for 1 story structures; whereas, T4-O has a minimum height restriction of 2 stories.” Caldwell has summarized the qualifications in a document you can see for yourself – download by clicking here. This sounds good to us. Confusing to wade through the jargon, but when you think about it, it sounds nice. This is what governments do. They prevent people from ruining neighborhoods in the name of unchecked property rights. And if you care about how your city looks and functions, this is the sort of thing you should care about. Why the rush? 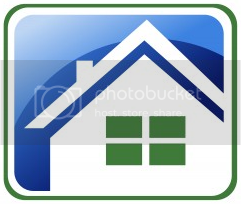 Well, the property is about to be sold, and the City would like to ensure that whatever is built there maintains the look and neighborhood feel associated with SmartCode. In other words, not a big box store with a bunch of parking in the front. According to Caldwell, this rezoning does not impede the larger effort to have SmartCode for the whole Cloverdale Five Points area. That debate is still upcoming. The Cloverdale-Idlewild Association voted unanimously at this week’s meeting to support the City’s rezoning of the Lowder property. The next step in the process will be a Planning Commission meeting at 5:00 pm on September 23. The Planning Commission meets at City Hall, Room 142 at 103 N. Perry St. Please contact Tyler Caldwell, City Planner, at 334-241-2728 or tcaldwell@montgomeryal.gov if you have any questions or concerns. Odds are that many MML readers were in receipt of an email circulated last month rallying folks to protest against what were described as immediate plans to build a big box pharmacy store on the corner of Boultier and East Fairview. Garish lighting? Impermeable cover? Parking lots? Hopefully by now most people know this was only a rumor. There are no such plans to ruin the character of one of Midtown’s best neighborhoods … yet. To preempt any damage that might be done to Cloverdale’s commercial district (and thereby the neighborhood’s character), the City of Montgomery has decided to push for SmartCode zoning in the district. City Planner and Montgomery native Tyler Caldwell (also a Midtown resident) came to our Cloverdale-Idlewild Association (CIA) meeting this past week to spread the word about the proposed change to the zoning. He was there to explain the city’s proposal (and the concept of SmartCode), and to invite interested community members to learn more about the proposal. Right now the Five Points area is basically zoned B-2. And it doesn’t have historic designation, so any new buildings constructed in those B-2 lots would be under no special obligation to “mesh” with the existing architecture and use of the area. In other words, there’s nothing now stopping a big box pharmacy (or any other awful chain store) from moving into the neighborhood. 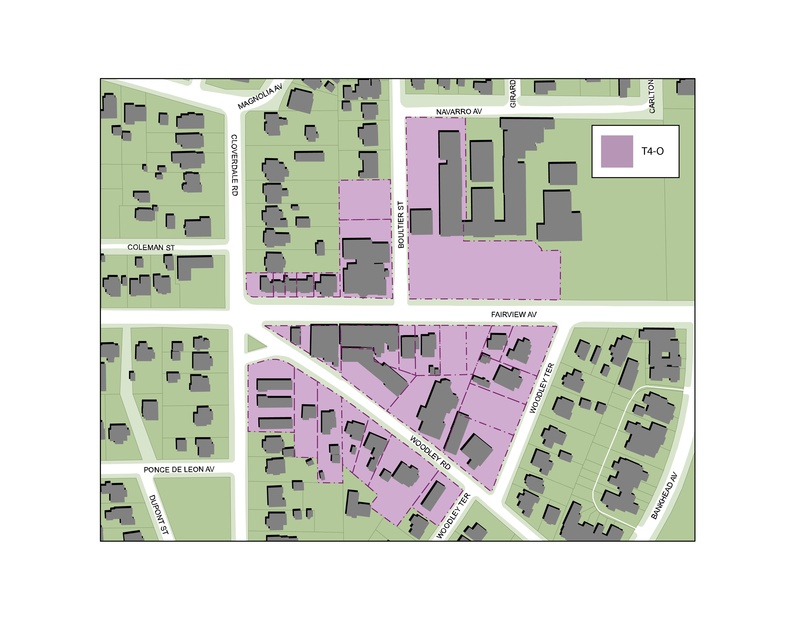 The proposed area for SmartCode zoning is in purple on this map Caldwell shared with us. Sure, SmartCode designation wouldn’t stop a pharmacy or an Urban Outfitters from moving in. But it would force their buildings to be in character with the neighborhood and compliant with pedestrian friendly guidelines. For example, SmartCode requires buildings to be close to the street with parking behind the building. This encourages cars to slow down. It also encourages pedestrian traffic — something that Montgomery has struggled to promote for a long time, especially in neighborhoods that are short on sidewalks. SmartCode requires sloped roofs and allows for mixed use development, so that apartments can be built above stores. It’s designed to promote urban living so that cities don’t just become places where you work and then flee for the suburbs afterward. One of the goals of SmartCode is to have buildings that can be reused over a century, rather than with a five year lifecycle. All of which seems like a pretty substantial improvement from the status quo. As Caldwell said: “If Joe California the real estate investor buys the building (neighborhood bar) Bud’s is in, there’s nothing in place right now to stop him from building something out of the character of the neighborhood.” We sure don’t want Bud’s to leave (where would we get our Stella Artois? Our dollar Sunday pool? Our hair smelling of cigarettes for days afterward? ), but if they did ever close up, we certainly wouldn’t want a Taco Bell in their place. Fortunately, Cloverdale residents have been seeking a solution to future bad development for several years. Caldwell was quick to credit the neighborhood for coming up with the zoning ideas that have become standard in places like downtown and Hampstead. 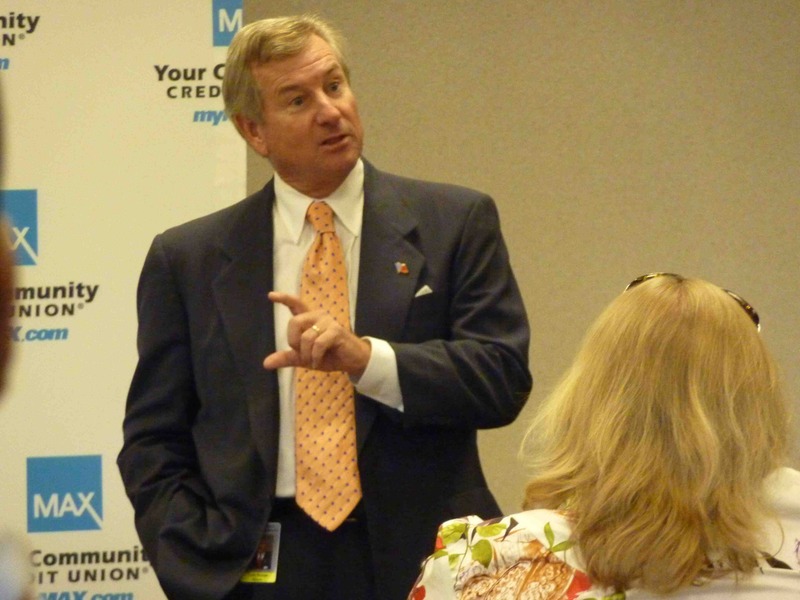 He cited the Five Points charettes that happened from 2005 to 2008 as creating a comprehensive plan for the neighborhood. The current SmartCode designation proposal is really just an attempt to implement something the community’s already gotten behind. Those seeking more information can meet Caldwell tonight. He’ll be talking at the Old Cloverdale Association’s meeting on Monday, July 19th at 7:00 in the basement of the Cloverdale Playhouse. 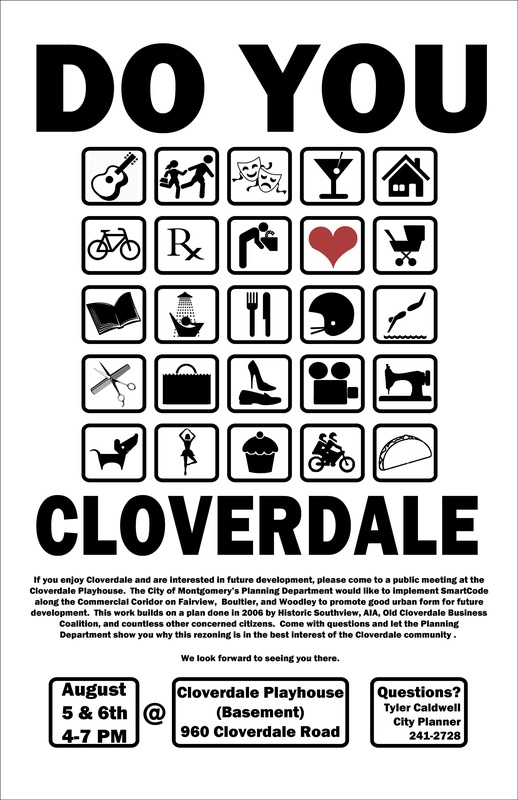 The city will be holding drop-in meetings for the public from 4-7 on August 5th and 6th in the basement of the Cloverdale Playhouse. Staff from the city will be there to answer questions and solicit input. They will present exhibits designed to show differences in the neighborhood under the existing B-2 zoning and the proposed SmartCode zoning. We’re wary of anything that takes sneaky linguistic tweaks to make itself sound better. And certainly the phrases “smart growth” and “smart code” could be used to justify any number of bad urban development and city planning ideas. But in this case, it looks like the city and the developers have the right idea. The goal is to fight the soullessness that is a near-inevitable threat in every city in the world (thanks to our globalized mono-culture). And an ounce of prevention is worth an unfathomable attempt to cure bad development post-facto, especially in a society that values property rights. Montgomery is really trying to get this right, and it seems like the changes are great, laudable, and worth supporting. At 21 acres, Vaughn Road Park isn’t Montgomery’s biggest park (that would be Lagoon Park, at 410 acres by far the largest of the city’s 90 parks), but it’s got to be one of the very nicest. Even in the most sweltering parts of summer, there are tennis courts that seem to be in use just about every day. Our tennis-playing friends tell us that the folks who play there are pretty intense/talented. There are shelters with benches and grills for cooking out and a well-kept half-mile jogging trail that traces the outline of the park. Along the jogging trail are the sad remains of a decayed Parcourse Fitness Trail (invented by the Swiss!) – the rings are still there (and likely to sear your hand right off if you touch them in summer), but the wooden sit-up planks are rickety and full of splinters. Too bad. Still, the grass is abundant and well-kept — and there are even nice pockets of shade around the park. On the weekends, Vaughn Park is full of people flying kites, boys practicing gymnastics, tiny children carrying around tinier puppies and being chased by family members balancing hamburgers and red plastic cups of sweet tea. The real star of the park is its playground. For children of a certain age, this is a paradise. Things that spin in crazy ways sit next to elaborate climbing devices. There are trails winding around the side under big overhanging lilac bushes for hiding and conspiring, floors that are rubber and thus less likely to cause injury, and ramps that make the whole park accessible to children of varying levels of mobility. Volunteer labor largely built this playground. With the of support New Haven-based Boundless Playgrounds, it opened in September of 2003 and has probably delighted tens of thousands of children since then. We had never heard of Boundless Playgrounds until visiting Vaughn Park, but are really impressed by their beautiful vision and ideas – and it’s so cool that one of these state of the art playgrounds is right here in Montgomery and accessible to the general public. The playground makes a trip to Vaughn Park worth it, even if you don’t take a turn getting a push on a swing. In an era where people view any municipal services as some kind of crazy Socialist tyranny, a visit to a city park can be a nice reminder of the value of community space. 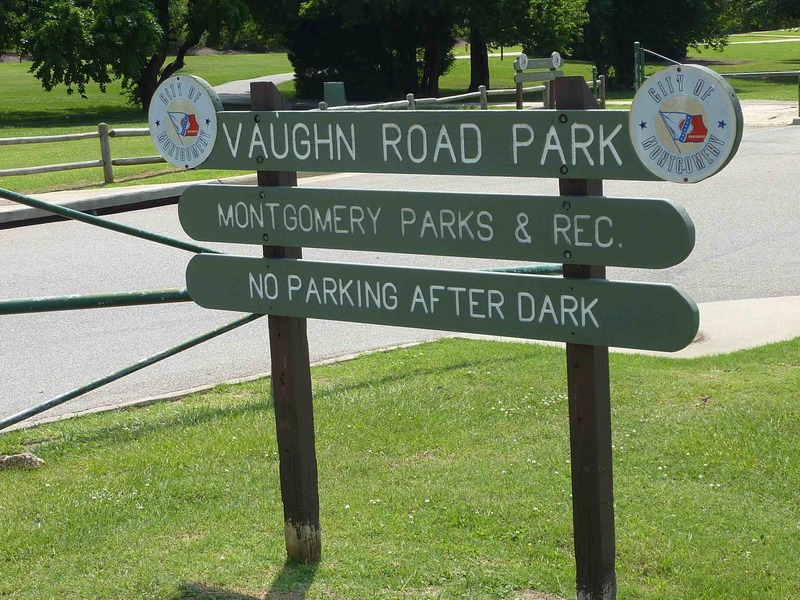 We don’t know enough to comment on how well the city funds its parks and recreation department (or how well that department does with the money it is allotted), but we can say for sure that Vaughn Park is one of the crown jewels of the system and our time in Montgomery is laced with many happy memories of trips there. Here’s hoping that the other parks in the city are one day as great as Vaughn. It used to be a sit and reach. Now it’s a Zen garden?